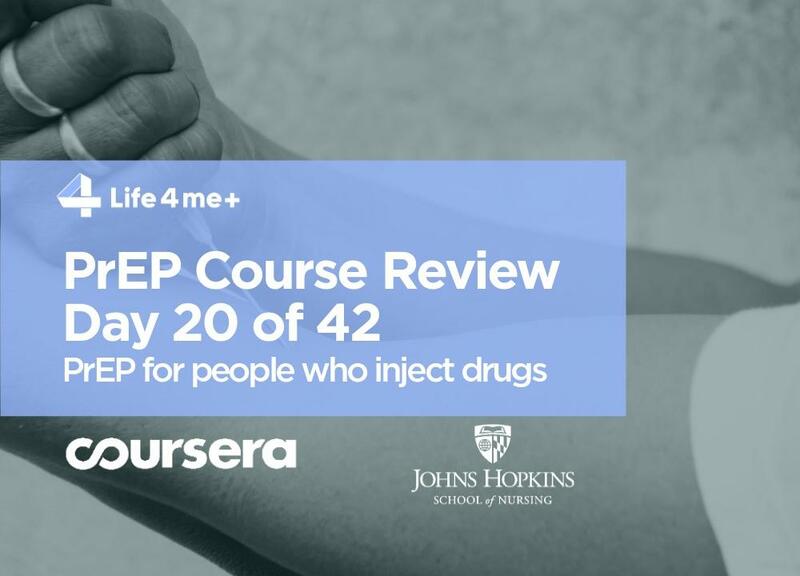 “PWID, HIV Infection and PrEP” lecture was read the topic by Greg Lucas from Johns Hopkins University of the 20th day of the online course PrEParing on the Coursera platform. Greg begins his talk with an HIV Epidemiology review among people who inject drugs (PWID). Next, he shifts to the types HIV transmission risks among PWID, harm reduction strategies and finishes with PrEP clinical studies among PWID review. 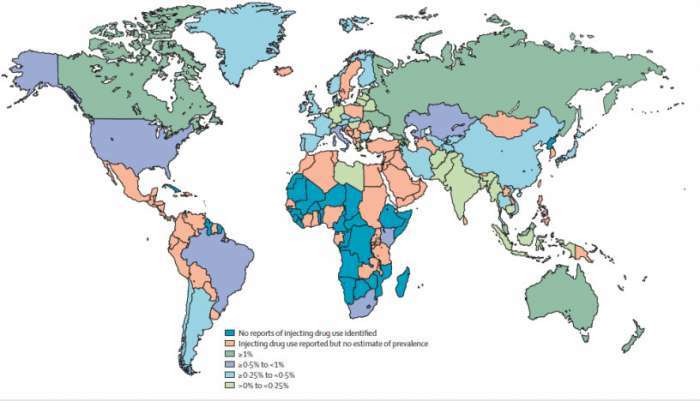 Injecting drug use remains a significant source of new HIV cases in the world, although there is a considerable variation in different countries. The slide (Figure 1) shows countries color coded by the estimated prevalence of PWID in the adult population. The sort of darker green color represents countries that have an estimated prevalence of PWID above one percent, which is quite high. And sort of the light green reflects the countries that have the lowest overall prevalence of PWID. High levels of PWID in Australia, Canada, but the highest are in Russia and Eastern Europe. The risk of HIV transmission among drug users in the United States has been significantly reduced through prevention and harm reduction programs. In Asia, there are foci with a high prevalence of PWID; these are the countries of Vietnam, Thailand, and Indonesia. The next slide (Figure 2) shows the estimated number of individuals who were newly diagnosed with HIV in each year period by risk group. 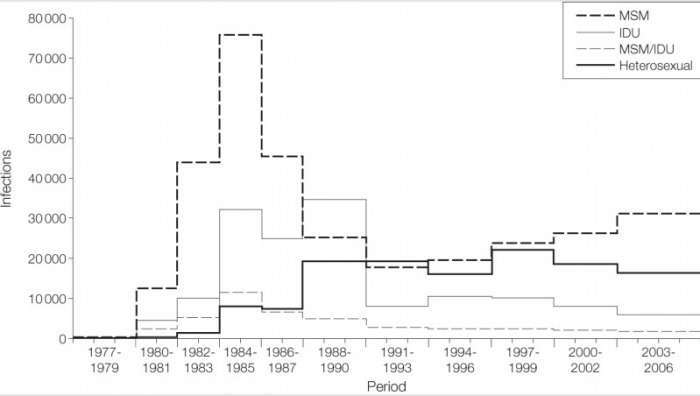 The dashed line represents MSM; they reached a peak of approximately 75,000 HIV infections a year in the mid-1980s. As can be seen in the graph, the number of cases in this group began to grow at the end of the 00’s. The light gray line represents the number of new HIV cases among drug users, and this number has reached a peak shortly after the peak among MSM. And then there was a similar fall off by the end of 00’s. And it continued to decline to the point where only about eight percent of estimated new HIV cases in the US were directly attributable to injection drug use. So, intravenous drug use without prevention and harm reduction public health programs can lead to a catastrophic HIV epidemic, as in the case of Russia and Eastern Europe. It is important to remember that HIV is not the only risk for PWID but also viral hepatitis transmission and drug overdose risks. Infections of soft tissues, endocarditis are also frequent. Injecting drugs can lead to trauma, suicide, family violence, incarceration. PWID become victims of murders more often than an average person. To reduce these risks, health providers have developed harm reduction programs. In addition to syringe exchange and methadone therapy, vaccination, such as hepatitis B, is included. PrEP can be considered a new tool for such programs. Medication assisted treatment with either methadone or buprenorphine being the sort of agonist treatments are used to maintain individuals and stabilize lives. Recently, the instructor says, a new method has appeared — naltrexone, an opioid agonist, offered for PWID who have been detoxed and are willing not to use opioid drugs in the future. To cope with the epidemic of a drug overdose, the researchers conducted another experiment — providing naloxone free of charge in many public health departments, and needle exchange vans buses. According to the plan, providing naloxone in the form of a nasal spray or injection for PWID, their partners, family members could reduce the number of deaths from overdose. Those PWID who are already HIV-positive are recommended to start antiretroviral therapy as soon as possible, both for their health and for preventing virus transmission to other people. Now PrEP appeared in the arsenal of epidemiologists, a continuous intake of pills by an HIV-negative person to prevent HIV transmission in case of dangerous contact. As we said earlier, there is only one drug for PrEP, a combination of tenofovir disoproxil fumarate with emtricitabine in the form of a tablet for daily administration. 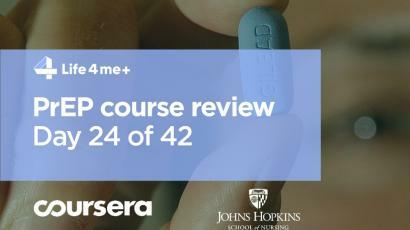 PrEP is recommended for use in high-risk groups, where use of this method will lead to a significant reduction in new HIV cases. PWID are at high risk. Most of the medicines are toxins for the human body, and pills for PrEP are not an exception. The advantages of PrEP are clear — it reduces the number of new HIV cases among people whose risk of HIV transmission is high. The risk of taking PrEP is toxicity for the kidneys from tenofovir and decrease in a bone mineral density. The risk is low, especially for young healthy people, which are the target audience for PrEP. Honestly, it is worth remembering about these risks. 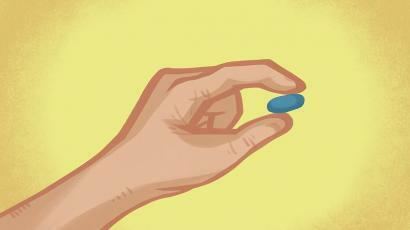 Another skeptics’ fear is that PrEP will provoke young people to take more risky behavior. Skeptics argue that when young people take PrEP, they will assume that risks are now under control and will make dangerous contacts more often. These fears have rational justifications. Randomized clinical trials can prove the validity of the risk. Greg cites the PrEP study among PIWD conducted in Bangkok, Thailand, where 2,400 participants were involved. Interestingly, for some people, participation in the study was part of the drug treatment program so was not entirely voluntary. Only ten percent of the program participants were active users of narcotics at the time of the study; twenty percent were in the clinic for methadone therapy. The results were striking — in the group of PWID on PrEP the transmission of HIV occurred in seven cases out of a thousand people, this is 0.7 percent. For comparison, the proportion of new HIV cases among PWID ranges from five to eight percent. This study showed that PrEP was effective for PWID, although researchers point to issues with statistics and evidence, new research and meta-analyses are needed to confirm the hypothesis. Accumulated data allows saying that PrEP is worth prescribing to PWID. It is important to inform PWID that pills intake should not be missed for full protection and this is a big challenge. After all, for example, in the USA, PrEP is appointed by a doctor or a consultant at a needle exchange program or methadone therapy. Employees of such programs have difficulties in communicating with PWID, with communicating on adherence to taking pills. As a result, low involvement in PrEP programs is observed among PWID. Another study of an incremental cost-effectiveness ratio from PrEP for IDUs has been performed resulting in $250,000 for quality adjusted life year for PWID in the US. There is a new version of tenofovir. So the prior, the original version was tenofovir disoproxil fumarate. There was a talk about it in the 10th lesson. The new version has less chance of causing toxicities than the parent drug or the original drug. Cabotegravir and rilpivirine drugs for periodic, long-acting injections are also being studied. There’s also evidence that antiretrovirals could be provided in depot formulations sort of like Depo-Provera. Depo-Provera is a contraceptive method for women. It’s made of a hormone similar to progesterone. It’s a shot that a doctor gives you in the arm or buttocks. Each shot works for up to 12 to 14 weeks, but you must get the injection once every 12 weeks to get its full protection. The less often people need to take the drug, the higher the likelihood of good adherence. So, on the horizon, new ways of delivering PrEP for IDUs are expected to be available. The lecture ends, and the instructor recalls that PrEP shows good results especially among people who have a high risk of getting HIV. For example, in a population at high risk of HIV transmission, providing PrEP will prevent about five new HIV cases per 100 people a year. In the next 21st lesson we will sum up the results of the third week, ask new questions and answer the questions of the second week. 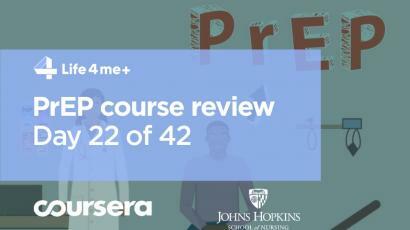 If you have not already signed up for the PrEParing course on the Coursera platform, it’s never too late to do it, just follow the link https://www.coursera.org/learn/prep.